The Continental Electrical Construction Co. (CECCo) chose Ecolibrium Solar’s EcoFoot2+ Ballasted Racking System to secure a 3.5 MW solar array – has been successfully delivered to the job site at Magid Glove and Safety Manufacturing Company in Romeoville, Ill. When completed in November 2018, the array will be the largest rooftop installation in the Midwest. Electricity generated from the array will offset 100 percent of Magid’s energy load and supports their mission as an innovator and cost-saving leader in the personal protective equipment (PPE) industry. Magid awarded the project to CECCo, Chicago’s No. 1 electrical contractor, and Convergence Energy, an industry leading developer of commercial and industrial solar projects in the Midwest. Ecolibrium Solar provided onsite technical support as the installation began on this record breaking solar array. Magid Glove and Safety is a leading manufacturer and supplier of safety solutions and personal protection equipment (PPE). 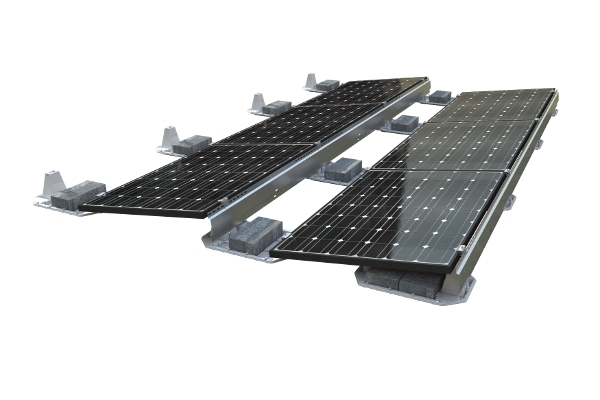 EcoFoot2+ provides a structurally rigid and electrically connected array while simplifying the installation process for flat-roof arrays. The system has an install speed of 13.5 modules per installer-hour, as rated by DNV-GL. This is the first large-scale Commercial/Industrial project benefiting from recent legislation passed in Illinois. The Future Energy Jobs Act (FEJA), passed in late 2016, will create jobs and support economic development in the renewable energy sector thru the monetization of the green energy attributes, or RECs (renewable energy certificates). Comprised of nearly 2,500 solar panels, the 812-kW system designed and installed by Freedom Solar Power includes two solar canopy structures on the parking garages, a roof-mounted solar array on the building and an in-lobby monitoring system that shows the energy savings in real-time. The limited space on the building’s rooftop was covered with panels during phase one, but phase two is where the real innovation took place — Freedom Solar Power designed and installed a custom solar canopy to shade the top floors of the parking garages while providing a significant amount of the building’s energy needs. The solar installation is expected to offset 50 percent of Strictly Pediatrics’ energy needs and generate more than 1.2 million kWh of electricity per year. The solar project will pay for itself in less than seven years. and save Strictly Pediatrics more than $3 million over the next 25 years. Mashpee Commons is an open-air shopping center that is the physical and social center of the quaint Cape Cod town of Mashpee. SunBug Solar was ultimately selected to carry out the project and was careful to address several key requirements of the client. At Mashpee Commons, where the visitor experience is paramount, SunBug Solar made sure not to impinge on the enjoyment of the guests. The use of heavy equipment was limited; all panels, racking and ballast was lifted onto the roof using cranes in the early morning to avoid interfering with shopping hours. Street trenching and overhead wires were also not allowed. To further complicate the project, the Commonwealth of Massachusetts requires a formal waiver from the Department of Public Utilities to install more than one net meter on a single parcel of land, so the seven rooftop solar arrays had to be tied into one main Point of Interconnection — without cutting pavement. SunBug Solar decided to use horizontal underground drilling to connect the arrays to the main panel (2,000 ft of underground conduit and wiring). In order to connect inverters on seven separate roofs to a single cluster controller, SunBug Solar installed NanoBeam wireless devices on each roof to wirelessly connect to the local area network.